Welcome, friends, to the Season 8 finale of The Walking Dead, the end of the ‘All Out War’, and the start of the new world. 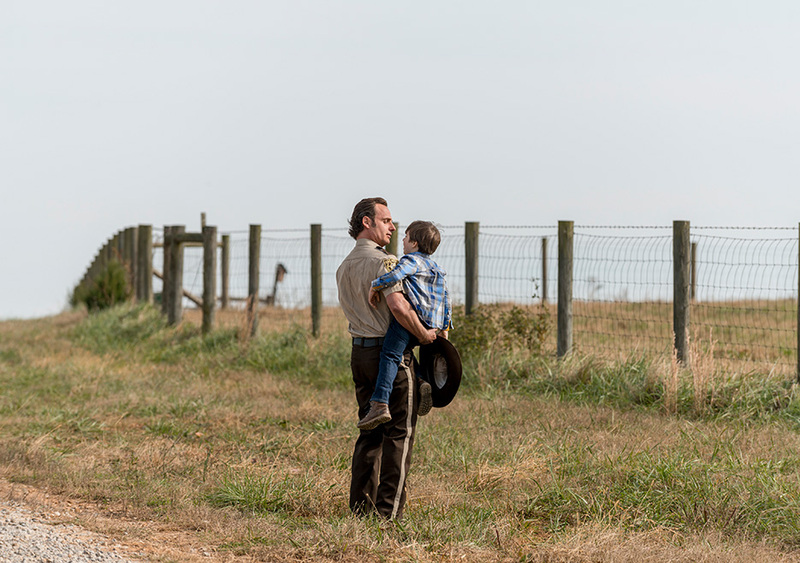 The plot: As Hilltop prepares for what they think is them having the drop on the Saviors, Rick and Siddiq run into one another checking on baby Gracie, and Rick finally asks how Carl came to be bitten. Henry is optimistic they’ll win today, Jerry & Ezekiel have a fun moment, and when the former-hostages come in from clearing out walkers outside the walls, Morgan nearly kills Henry in his confused and unhinged state. 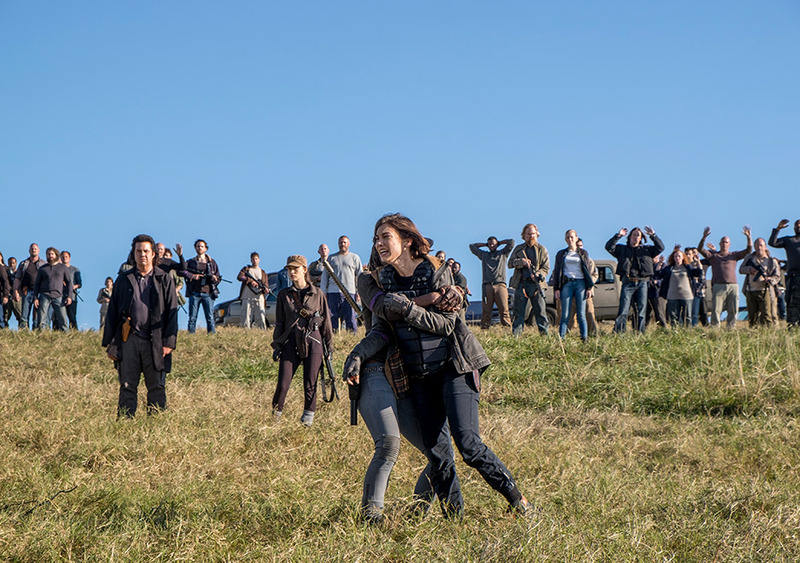 Rick and his trusted fellow main cast members lead the group making the attack, while the rest stay behind at Hilltop with a plan to escape (except for Gregory, but screw that guy). They head out, taking out the bait Saviors there to lure them into the trap, which we hear Negan ‘confess’ to Gabriel on route to it. 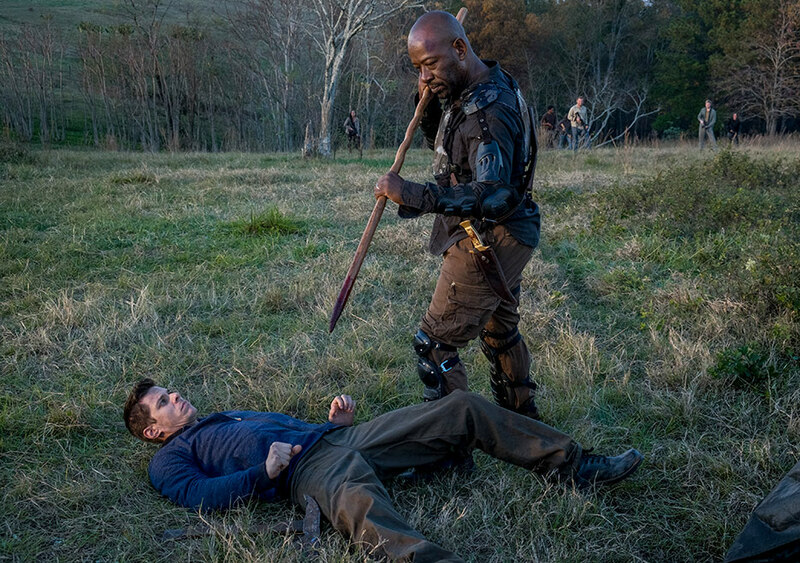 Gabriel attempts to escape, but is thwarted, and he and Dwight are both brought as prisoners to the would-be execution of Rick’s group. But as the Saviors all take aim at the group, with the bullets Eugene made, every single of them backfires! Most of them surrender, Negan runs off, and he and Rick get into a brawl by the tree with the stained glass panels we’ve seen in the flash forwards all season. 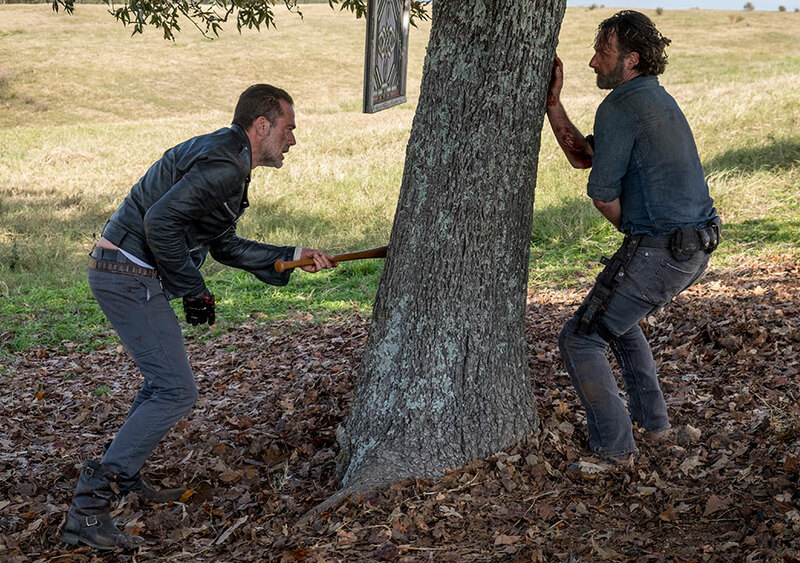 Rick asks him for 10 seconds, for Carl, to convince him there’s another way, that they don’t have to fight and just as Negan hesitates, Rick slashes his throat with a piece of broken glass! But there’s one more twist: Rick turns to the gathered group who has watched this go down and tells Siddiq to save Negan’s life. 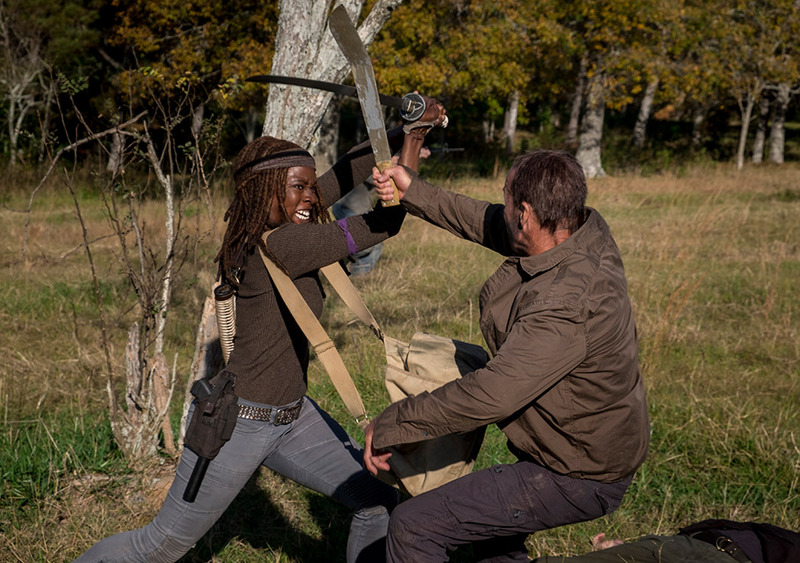 Maggie screams in protest as Michonne holds her back, and Rick tells the rest that their new world, their better world, starts now, and anyone who can’t live by that will be dealt with. Also, the Oceansiders come to save Hilltop when some of the Saviors attack there. In the aftermath, we see that the Sanctuary is being run by the wives (no longer in black dresses), Dwight is sent on his way with a car by Daryl to find Sherry (who just may be waiting for him after all), Gabriel has found his faith again, Alden is staying at Hilltop so he can help build the medieval tech in that book of plans Georgie gave them, and Rick and Michonne tell NEgan that he’ll be alive and living out his days in a cell as proof that the world can change. 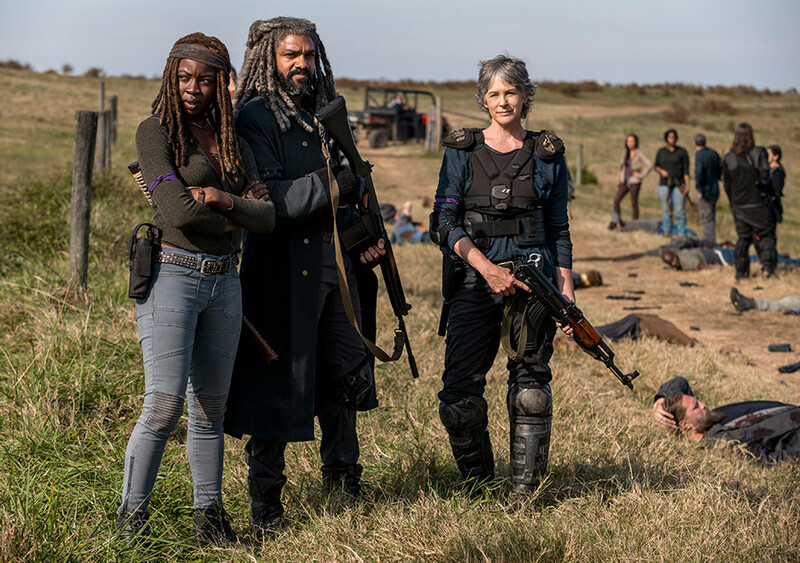 Meanwhile, an angry Maggie, Jesus, and Daryl secretly agree that letting Negan live was wrong and look like they’re being set up to be our next villains, which is weird. Given the title of this episode, ‘Wrath’, and the theme of mercy versus wrath that we’ve had this season, I revisited the review of the first episode, ‘Mercy’, before watching tonight. It was good to get a reminder of where everyone started this season, especially Rick, who was merciless in that episode despite it’s title. Will he be without wrath in this one? It seemed he finally hit a turning point after slaughtering those escaped hostage Saviors along with Morgan, after all. Rick went from being, well, Rick to essentially being Negan, something that hasn’t gone unnoticed by those in the show (though no one’s said it like that) or those watching it. It’s on Rick tonight to prove he can turn things around and be the better person and better leader again. Can he change the tide of war, let his mercy prevail over his wrath, and find a way to that something after Carl believed in? So as much as the big story is about Rick and Negan, I have to talk about Eugene first off. He completely had me fooled last week, so hats off to you, sir! Both the character and the actor. Eugene’s a character who could so easily be annoying in the hands of probably anyone else, but Josh McDermitt plays him perfectly. His intensity and fervor after getting back last week had me convinced that he was all in on Team Negan, but I was wrong. The moment of every Savior’s gun backfiring, literally, was fantastic. Without Eugene, everyone would have been dead. Rick’s new world aside, Eugene is the one who saved the day here. I’m so glad it happened, and I’m glad it actually didn’t all rely on Rick or one of the usual heroes this time, but instead on the often annoying, very odd, uncharismatic, unheroic, but very intelligent Eugene. I also loved his brief reunion with Rosita at the end–and yes, he did deserve at least one punch for what he put them through and for throwing up on her. It’s odd the sort of things that are reasonable to let go or and also to hold onto in this world they live in, isn’t it? Okay, back to the big two: Negan and Rick. The episode had good action that moved forward quickly, but its twists were small rather than the big ones you would expect to find in a finale episode. Up until that moment when the guns all failed, the plans progressed exactly as intended, and while I was wondering just how exactly they would get out of this, I wasn’t surprised that they did. But, the next shocker for me came when Rick slashed Negan’s throat. So for the record, no without wrath! I was again wondering how this would play out: would Rick somehow actually convinced Negan to stand down? With his people bending the knee and him already injured, appealing to his caring for Carl seemed like it might actually work for a second there. It really looked like Negan was hesitating, but in retrospect, I can’t see him actually giving in. Not at that moment, not really. He wasn’t in the right place or mind to make peace with Rick. But wow, after what happened at the bar, I did not expect to see Rick sucker punch–make that, sucker throat slash him. And once he’d done that, I also didn’t expect that he was going to have Siddiq save his life either. But maybe Rick didn’t even know–when he fianlly has his line “My mercy prevails over my wrath,” for the first time, I realized that he sounds surprised that that’s what happened. Asking Siddiq to help is notable not just because it means he doesn’t want Negan to die, but also because he’s trusting Siddiq, period. He could barely talk to the man two episodes ago, but now he’s trusting him to save the life of his greatest enemy, in front of everyone he needs to convince that he’s making the right choice, and he’s not even supervising the attempt. That’s a huge change. Then the speech that Rick goes into, this one felt to me like the speech he had always planned to give the Saviors at the end of the war, assuming they won. It feels a bit rehearsed, but that’s fine. I can respect that at this point he’s running on empty and relying on what he had planned from the start. The moment is overall brief, after all, and he then collapses by the tree and begins sobbing now that it’s over, now that he can let himself feel the stress, the grief, the relief. When we see him next, talking to Negan with Michonne about how the world is going to change now, Rick is a different man. He’s sure, he’s hopeful, he’s still firm and determined, but it’s different now. I am curious to see how they’re relationship changes now, and how Negan changes, moving forward. The other big surprise for me was at the end with Maggie, Jesus, and Daryl. Oh boy. Now, I understand why they’re both pissed at Negan not being dead; well, for Maggie and Daryl anyways. Well, for Maggie. Well, actually, no. I understand her anger and grief, but all season she’s chosen mercy and being a good leader, looking to the future. Those decisions don’t add up to her speech at the end of the episode for me. And while I know Daryl went through a real crappy week with the Saviors, but his anger about that has always felt out of proportion. Maybe they’re building on that he lost a lot of friends in addition to the psychological torture they pulled on him, but I think the show hasn’t communicated precisely what Daryl is so pissed about very well. Since that continuing anger is going to be important, I hope they clear that up. But even so, this whole plotting against Rick decision feels a little too far for them. Especially for Jesus! I know he’s all about Maggie as leader, but his grin when she explains her plan to show Rick how wrong he is was weirdly out of place. The mood and lighting in this scene feels like they’re setting these three up as villains now, and I’m loving that idea. Negan’s continued survival being a point of contention between them I totally understand, but having it turn them against one another? We’ll see what happens, but I’m hoping that isn’t where things go next season. 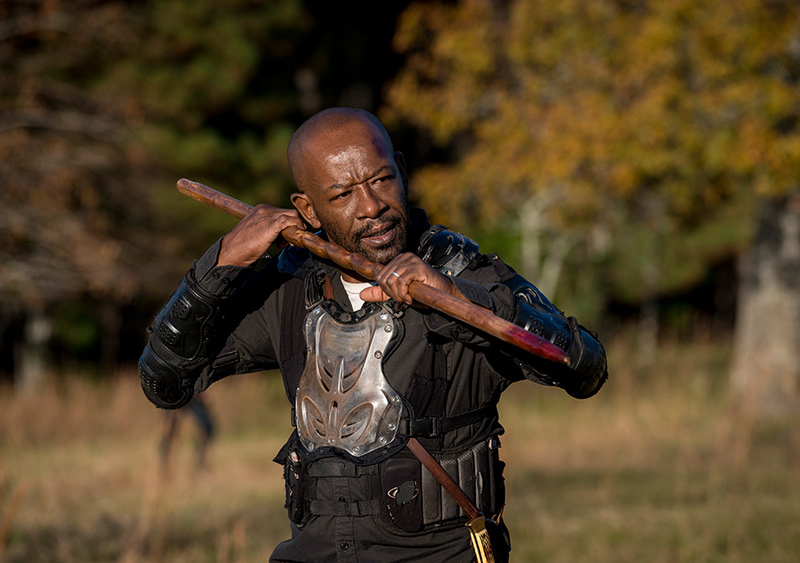 Morgan of course also had some notable changes tonight, biggest among them that he’s realized how off he is, but also that he can go back to not killing the living. It doesn’t seem to be an easy thing for him to go back to, and I think it would’ve been nice to get more interaction with Morgan and Jesus talking about these things leading up to this, but I’ll take what we got. More about him on Fear the Walking Dead this season, though! Gabriel seems to come back to his faith, and maybe his eyesight, Jadis’s real name is Anne, the wives get to be single and in charge and not wear those little black dresses anymore, Carol is going back to the Kingdom, and Alden is staying at the Hilltop to build things. The shadowy cabal of Hilltop aside, it looks like the new world is off to a pretty good start. All Out War has been a long road, maybe a little too long, but overall I’ve enjoyed it greatly. Negan not dying is a bold choice, but I love Jeffrey Dean Morgan’s portrayal, so I am happy to have more of him. I’m also happy to see the world change, however, and I think these characters have earned a little peace. What about you? What did you think? Are you happy with the outcome? Unhappy? What are you hoping for next season? And as always, thanks for following along with me this season! You can catch me on the Fear the Walking Dead reviews starting next week, and I’ll see you in the Fall for Season 9! The finale episode was a solid one. The action was fast-paced and they did not waste any time, and there were some legitimate surprises that worked very well in the episode. I'm glad that Rick's on the side of the good once again, but his throat slash on Negan reminds us that he's far from going soft here. He's determined to make a better world, and he'll defend that world, dammit. I love that Eugene of all people got to save the day, too. I really liked the framing of the episode with Rick writing a letter to Carl in return about Carl, essentially, saved him. I'm not so sure about the suggestion of Maggie, Jesus, and Daryl turning against Rick, but we'll see what happens come next season. And please, may it bring a nice big time jump when it comes! These guys need a good long break from the war and violence.